Today the police continued the largest police deployment in the history of the state of NRW, the evictions in the 12,000 year old Hambach forest. 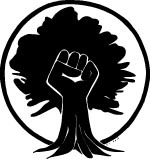 Early in the morning police entered Oaktown and Gallien and began cutting several trees and evicting treehouses. Throughout the day the police cut down around 40 trees in and around Gallien, pulled out the stumps and roots left behind, and filled the holes with sand, to make it unclear, how big the trees were. In the treehouses Pyra and Mona, in the Oaktown occupation, activists locked themselves on to concrete blocks under the floors, to postpone the eviction as far as possible. The eviction of these treehouses, that were some of the oldest in the occupation, and for a long time been home to the activists, took several hours. 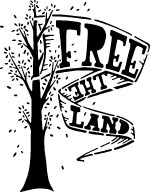 To reach the treehouses, the police felled several trees, and cut off large parts of the crowns, close to traverses, in which activists where hanging. At this point activists made it official, that under the hut Simona, a tunnelsystem, in which several people were locked on, was to be found. Even though many activists made it explicitly clear, that the use of heavy vehicles in the area, would put the lives of the people below in danger, police continued to drive around heavy eviction-equipment in the area. Besides this, the police let the engines of the machines keep running, close to the ventilation of the tunnelsystem, furtherly endangering the activists. Also in the so-called „North“, another treehouse-village, the police continued their activity, and attempted to evict an unsecured activist from a skypod. Here they felled trees close to the ropes on which the skypod was hanging, another life-threatening situation. 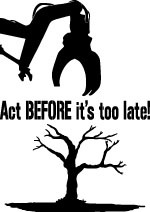 The action of the police, which ironically is based on „a lack of safety in the treehouses“, is bringing activists in the Hambach forest occupation into increasingly dangerous situation, and continually threatening the lives of the people. 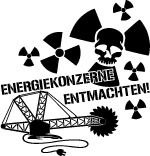 Responsible for the this insanity continuing, is the interior minister of NRW Herbert Reul (CDU), who supports energy-giant RWE with the weapons of the state, treads down the rights of human and nature, showing his priority of profit over the well-being of people. Therefore, we are demanding, that the police immediately removes the state of „danger-zone“, that is threatening the lives of people, and has already killed animals and plants, and leaves the area! Today many people also showed their solidarity with the occupation. 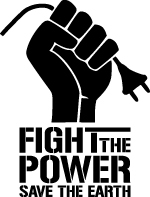 The movement for the preservation of the Hambach Forest is growing ever wider, and we will keep occupying the forest, standing in opposition to RWE, and fighting for life! Hambi stays, today and forever!